On stage, I’m often accompanied by robotic instruments – devices I’ve designed and built to give my live performance an arresting physical appearance. I’ve fashioned these from found objects and old acoustic instruments. At first glance, these automatic accompanists might seem more at home in a 1930s cabaret than an experimental electronic set. But as soon as they move and help to create the music, I hope any notions that this is a novelty act are dispelled. As a composer who works extensively with electronics but wants to create a spectacular performance on stage, I find these machines offer a compelling alternative to the laptop or loop pedal. My music has often played with notions of the uncanny (das Unheimlich). It revels in lankins, revenants and fetches – those doppelgängers and other exotic creatures who slip into our dreams (and sometimes our homes) in English folklore. I love the resonances between these fictional, uncanny creatures and certain kind of robots: inanimate, homely objects which become rather unsettling when sensors and actuators give them a primitive animacy. Thus, I find robots offer a meaningful physical analogue to the sound world I’m creating. Tightly coupled with the music, the robots’ actions draw people into the performance – I hope they make the performance more absorbing and visceral, nothing like a typical laptop set. 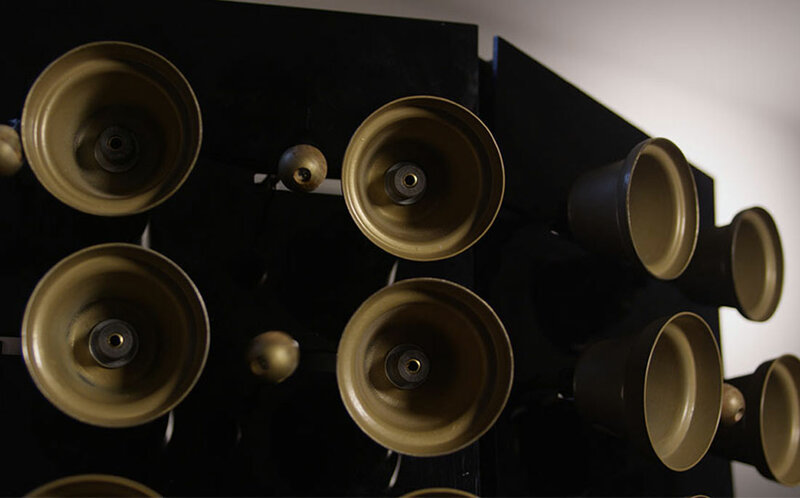 These are unlike any other machines around – the audience can only fathom the set as it happens. I don’t have many video clips of my act as I really do feel you need to be in the room, with me and the robots, to get the full effect. 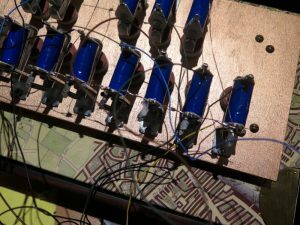 I started building robot performers around 2005 as I wanted to layer several sounds on stage and was seeking a more theatrical alternative to a laptop or loop pedal. My earliest robots were figurative. Hugo is the head of a ventriloquist’s doll, wired up and roboticised after he was spirited away from the attic of a dead magician. Wolfgang is a 1960s 1/4-sized mannequin who plays the drums. And Edgar Allan, the crow, used to come out on cabaret nights. Over the last few years though, I’ve found myself moving away from these figurative pieces and enjoying the spectacle of roboticisng other kinds of objects. The Ealing Feeder is a polyphonic carillon which I’ve built to play riffs at lighting speed on a set of 28 bells. The Air Loom is a wheezing, robotic Shruti box. And Ventricle is a blood-red handbag which beats in time with my heartbeat. 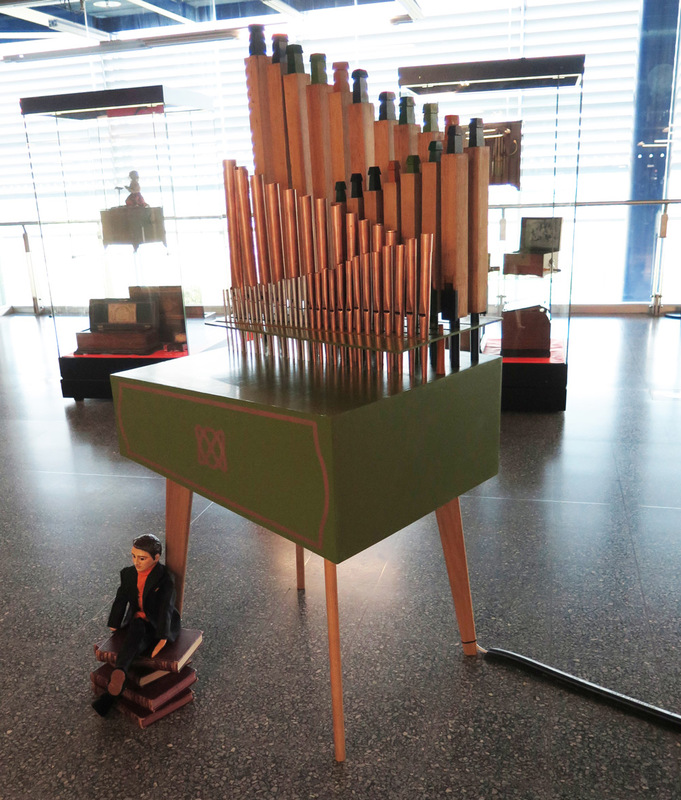 In 2015, Colin Uttley and I adapted a fully-automated pipe organ (one with 61 stops). I actually wasn’t that satisfied with the results as there were no visible moving parts. 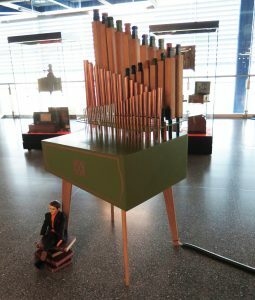 I’m now adapting this again to make a portative organ that sits in the lap and is played with bellows pumped by hand. Strictly speaking, when my robots are in their performance mode, they aren’t robots at all but automata as they are obeying preprogrammed routines. 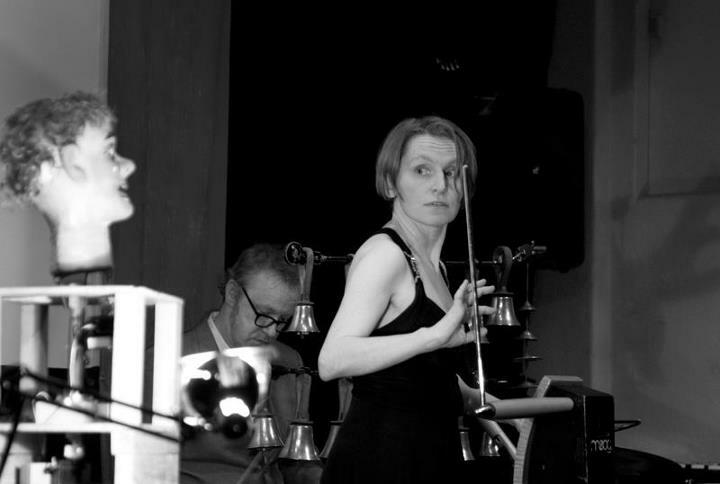 The possible exception here is theremin-playing doll Clara 2.0 who moves her hand in response to the note she’s making on her theremin and to the sound of her guide track. I work like this as I need to co-ordinate the robots’ actions with live vocal and instrumental performance on the stage. I control the robots in real-time using bespoke Max/MSP patches and a selection of microcontroller boards (whatever I’ve been able to extract from former exhibits), Arduinos and servo boards among them. I have various methods of triggering the robots during songs – and I use plenty of misdirection to keep the audience guessing about how the show is held together. Off stage, I like to give the robots some more autonomy now and then. For instance, I’ve hooked Hugo up to a webcam and and optical flow algorithm so he can follow people and objects around the room. And I’ve controlled the Ealing Feeder with a Geiger counter so it sonifies the radiation count in a room. As feats of engineering, my robots are admittedly fairly simple. In fact, that’s the curious thing about stage robots: when they are seamlessly mixed with live performers, people tend to credit them with intelligence and intentions that they don’t possess. I doubt anyone would be half so impressed with such low-rent robotics if it was embodied in a virtual character on a screen. 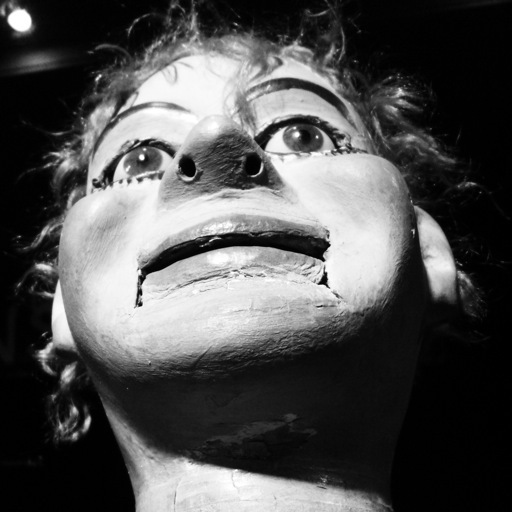 Somehow, we’ve become blasé about screen-based artificial life (thanks to the wonders of Pixar, Nintendo et al) – but we’re still wowed by a cheap ventriloquism act like Hugo, admittedly one that’s augmented with robotics. I’ve taken care of all the electronics, motors and coding of the robots. The housings and mountings were built in partnership with Colin Uttley. We’ve made a modesty cover for Hugo’s motors but I rarely use it. In general, I’ve resisted the temptation to cover up the workings of the robots and make them as neat and tidy as the laptops they’ve replaced. The audience seem to find the robots particularly unsettling – uncanny – when they can see their motors, wires and levers. I think this may be partly down to the novelty of seeing some electromechnical devices on the stage. Perhaps this also relates to the idea of the ‘unhidden’ (one interpretation of the word Unheimlich) – it’s disturbing to see the guts of a machine which seems to have some kind of animacy. I also think some scrappiness emphasises the robots’ identities as one-off, hacked objects. And it increases the sense of jeopardy – the anxiety over whether the robots will make it through the show. Perhaps this is cheating – but I like to think I’m working in the tradition of those old-school plate spinners who deliberately make the plates look a little too wobbly. The Ealing Feeder playing birdsong, automatically transcribed by Dan Stowell, Queen Mary University, London. Video taken on Dawn Chorus Day, Rotherhithe, by Katrina Townsend.